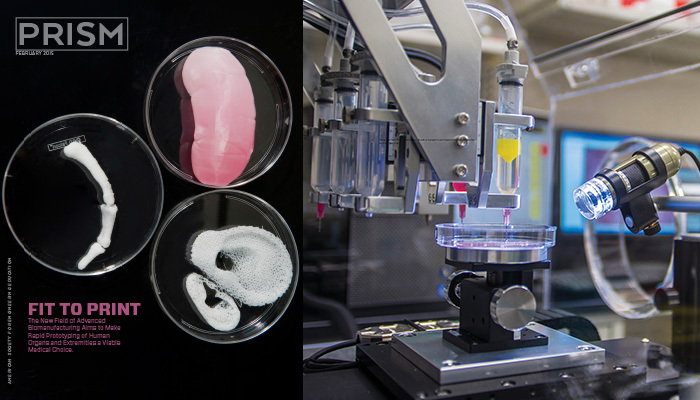 A new engineering discipline looks ahead to the manufacture of personalized organs for testing or replacement. Kaiming Ye, a professor of bioengineering at Binghamton University, has a vision of health care’s future: A patient goes to see his doctor complaining of chest pains and is diagnosed with serious heart disease. Some of his cells are collected, perhaps from a biopsy or a blood sample. The cells are processed and become the base material to create a new, healthy heart – possibly made with a rapid prototyper, or 3-D printer – that’s unique to him. Soon afterward – perhaps even later that same day – the new heart is ready to be implanted in the patient’s body, replacing his old, damaged ticker. Ye foresees similar processes being used to replace many other damaged or diseased human tissues and organs. Indeed, any technology that can manufacture a muscle as complex as a heart could easily churn out simpler organs, such as livers and kidneys. Bespoke spare parts for broken humans may sound like science fiction, but Ye is convinced that such a medical revolution is relatively close at hand – provided that an industrial base can be developed to support it. “This industry does not yet exist; there is just a collection of individual labs,” he says. That’s why for several years now he’s been one of a number of academics who have been active in an effort led by the National Science Foundation (NSF) to create both an engineering discipline and an industry: advanced biomanufacturing. The aim is to provide the manufacturing base not only for tissue engineering – the constructing of whole human tissues and organs for drug screenings and, ultimately, transplants – but also for the fast-growing field of cell-based and personalized therapies, or regenerative medicine, that use cells, either as immunizations or as part of patches and implants, to cure a range of ailments. The history of tissue engineering and cellular medicine is relatively short. It’s been a defined field only since the mid-1980s, and today’s modern versions began in the late ’90s with the development of stem cell technologies, particularly the invention of a process to reprogram mature adult cells back into stem cells, or pluripotent stem cells, that can be coaxed into growing any type of tissue. An early success came in 1999. That’s when Anthony Atala, director of the Wake Forest Institute for Regenerative Medicine, successfully used stem cell-coated scaffolds to create artificial bladders for seven children suffering from spinal bifida. More recently, in 2013, surgeons successfully transplanted a bioengineered trachea into a 2-year-old girl, although the child later died from other complications. Propelled by new technologies – primarily 3-D printing – the field has shifted into overdrive. An important paper from two years ago, written by a team led by Wendell Lim, a professor of cellular and molecular pharmacology at the University of California, San Francisco, claimed that “today, biomedicine sits on the cusp of a new revolution: the use of microbial and human cells as versatile therapeutic engines,” that would become a new “third pillar” of medicine now dominated by small-molecule pharmaceuticals and biologics, such as recombinant hormones and antibody-based drugs. But this nascent revolution, it added, “will require the development of a foundational cellular engineering science that provides a systemic framework for safely and predictably altering and regulating cellular behaviors.” And that is “where advanced biomanufacturing is heading,” says Athanassios Sambanis, program director of NSF’s Division of Chemical, Bioengineering, Environmental, and Transport Systems. A new discipline is needed “in order to identify the critical challenges and barriers that need to be overcome to advance the field,” and to educate the engineers and scientists who would run it, explains Sambanis, who is also a professor of chemical and biomolecular engineering at Georgia Tech. Essentially, NSF is marshaling its influence and funding prowess to create and name a new engineering discipline that’s laser-focused on regenerative medicine. The notion wins praise from regenerative medicine researchers. “There is definitely a need to standardize the processes for tissue-engineered regenerative medicine therapies to bring down costs and to make the manufacturing processes more economical, efficient, and sustainable,” says Atala, whose institute has initiated a research program with an industrial engineering school and participated in one of NSF’s advanced biomanufacturing workshops. Outside NSF, what is called advanced biomanufacturing remains quite broad and elastic, and this can be confusing. For example, the U.K.’s University of Sheffield boasts an Advanced Biomanufacturing Center, but its research is wide-ranging and includes areas NSF feels don’t belong in the discipline – biological processes to produce chemicals, energy, and food, for instance. “Globally, so far, there is no agreement on what advanced biomanufacturing is,” says Alexander Leonessa, an associate professor of mechanical engineering at Virginia Tech who directs NSF’s General and Age-Related Disabilities Engineering program. The name “does not actually capture the real work involved,” he says. Some involved are now considering finding a new name. Implants and patches are likely to be the regenerative therapies that first come to market. “It is easy to see that happening within a few years,” says Christopher Bettinger, an assistant professor of biomedical engineering at Carnegie Mellon University. Tissues grown on scaffolds expressly designed to fit a patient’s needs could be used to treat cartilage or bone defects. Cell-infused myocardial patches could be affixed to tissue damaged by a heart attack to help it regain normal strength. There is also hope that some types of spare parts could also be universal, off-the-shelf components, perhaps based on animal parts. That would clearly help reduce costs. But humans risk severe immune rejection from animal transplants, so researchers in recent years have developed methods to decellularize animal tissue, essentially cleansing it of living cells, so it can be used as scaffolds. Investigators at Britain’s University of Leeds, for example, helped pioneer a decellularization method a couple of years ago, and then used it on heart sacs and valves from pigs that have been used in clinical trials. That approach draws skepticism from Binghamton’s Ye, although he admits that “it is fantastic technology.” For one thing, he says, animal organs are often the wrong size for humans, and they also have different mechanical strengths. And even though they are decellularized, he says, they could still introduce dangerous pathogens into patients. Ye thinks that organs built from scratch could be readily available within five to ten years, at least the most basic ones, like pancreases and livers. Hearts are very complex, of course, and lab-grown artificial ones are likely a couple of decades away. There are at least three different methods to build organs from living cells. The one that gets the most attention is 3-D printing, which uses a cell-rich biological ink, or hydrogel, to build an organ one ultrathin layer at a time, based on complex computerized three-dimensional models that include vascular systems. There is also the original method of building organs with cells on scaffolds, which is how Atala fashioned his bladders. His biodegradable scaffolds were formed from collagen, or a composite of collagen and polyglycolic acid. A third method, used mainly in Japan, is a two-dimensional construct that also grows its own matrix and self-assembles into a three-dimensional organ. Another possible technology is the so-called organ on a chip, a microchip onto which are embedded and wired cells culled from a patient to determine how a drug would uniquely affect one of his or her organs. Already there are companies working to commercialize this type of technology. “It is a great advance, but it is limited,” Sambanis says. While it can determine the impact of a drug on one or perhaps two organs, it cannot reproduce how it might affect the patient’s whole body. To get around this, Ye says, researchers are working to compartmentalize the entire human body into individual modules, “like a functioning individual,” and place and connect all those modules on one chip. NSF is hoping to soon schedule a workshop to try to see if a consensus can be reached among investigators on criteria to eventually judge which method works best. While ultimately researchers expect that human-made organs will be used for transplants, most likely they will first be used for drug screening, obviating the need for some animal and human trials. This would cut development costs. Indeed, the current high cost of bringing new therapies to market is one of the attractions of cellular medicine. How patients react to small-molecule and biologic drugs is hard to predict, which is why those drugs take, on average, 14 years to develop and have a failure rate greater than 95 percent. It can cost around $2 billion to successfully commercialize a new drug therapy. As the UCSF study noted, cell therapies are highly complex, but that complexity “might actually make these agents more predictable in the clinic than small molecules or biologics,” and therefore cheaper to develop. For now, tissue engineering and cellular therapies are extremely costly. Nevertheless, some companies are already using patients’ immune cells to treat cancers. “There are advantages,” Sambanis says, mainly that unlike chemotherapy, there are no harsh side effects. But so far these therapies, besides being very expensive, do not perform spectacularly better than other drugs. That’s because the way they’re now manufactured is inefficient, Ye says. Currently, everything is done manually, so outcomes depend on who collects the cells and who alters them. “You need more quality control,” he insists. The goal is to devise standardized, automated systems that rely on good manufacturing practice to harvest and manipulate cells before they’re injected, embedded onto patches or implants, or grown into an entire, transplantable organ. “We need to increase the efficiency of the processes,” asserts Bettinger. Another problem is how to scale up personalized medicine. If you are talking about transplanting hearts, for example, each person needs only one, but there may be a million people in need. So that’s one million hearts, all unique. And unlike traditional manufacturing, which relies on uniform types and amounts of raw materials, each personalized therapy will need different raw materials. And yet the final results have to have some unity – each heart may be a singular construct, but it must perform like a heart. It won’t be easy to accomplish these tasks, warns David Williams, a professor and director of international affairs at the Wake Forest institute. Williams – who is also president of the Tissue Engineering and Regenerative Medicine International Society (TERMIS) – co-authored a paper last year in Science Translational Medicine that pointed out the difficulties in trying to standardize and automate manufacturing processes that produce patient-specific treatments. Industries also need supply chains. For this one, key suppliers would provide the building blocks of synthetic biology, which are often called biobricks. These blocks of DNA sequences are placed into living cells – human ones, but often E. coli bacteria cells – LEGO-like to rewire them to induce a function that does not exist naturally, say, perhaps stopping the overproduction of a protein that causes a disease. “It is the building of a whole system, up from the cellular level,” Leonessa explains. Also important to advanced biomanufacturing, but not part of it, will be more effective monitoring and imaging technologies that will better enable physicians to see how transplants are working. Non-invasive devices that monitor the creation of new tissue or organs also need to be invented. If you are brewing a new drug in a bioreactor, it’s possible to remove a small sample for testing. “But if you are growing a heart from stem cells, if you take one cell out, you stop the process,” Ye explains. While there is so far no estimate of how big a domestic or global industry could be built around advanced biomanufacturing, NSF staffers say that the industry could give a significant economic boost to America’s economy. Recently a group of proponents traveled to Europe and Asia to assess the global status of advanced biomanufacturing research. “They [European and Asian researchers] are heavily investing in this area,” Sambanis says. “They think that this is the future, not only to treat patients, but an economic opportunity.” For example, a recent paper by Portuguese researchers outlined the advances made in biofabrication techniques to regenerate and repair damaged skin, and the challenges that remain; University of Edinburgh researchers will soon begin clinical trials on a cellular therapy to stimulate liver stem cells to form new, healthy tissue and repair damage caused by cirrhosis; and researchers at Sweden’s University of Gothenburg are pioneering efforts to bioengineer uteruses to treat infertile women. Any discipline that’s capable of overhauling how health care is provided will undoubtedly be huge. And, Leonessa says, major pharmaceutical companies are paying attention, and many see a need to get involved. Big pharma produces and earns billions of dollars from a variety of drugs, including those to, say, treat diabetes. But if engineers eventually produce new, transplantable pancreases from stem cells, demand for insulin will disappear. “It will revolutionize what they [big pharma] do, or take them out of the market,” Leonessa says. There are, of course, words of caution. Williams organized a conference on regenerative medicine in Xi’an, China, which highlighted some of the remaining barriers. They include difficulties in developing a systems engineering approach to integrate all the new fast-developing technologies used in advanced biomanufacturing, such as stem cell science, biofabrication techniques, and imaging of regenerated tissue; a lack of internationally accepted standards for testing engineered tissue; the conservative attitudes of many regulatory agencies; high costs and not enough funding; and ethical concerns. Indeed, technology consulting company Gartner Inc. warned in 2013 that the technology to bio-print organs is advancing so rapidly it will spark a major ethical debate as soon as next year. “The ability to print human organs and tissue will advance far faster than general understanding and acceptance of the ramifications of this technology,” said Pete Basiliere, Gartner’s research director. There will be worries if nonhuman cells are used in organs, and concerns about quality and production techniques, he said. That is why it’s important to urgently grow an industrial base for advanced biomanufacturing that’s steeped in quality control, Ye says. Good manufacturing practice will help convince regulators – and the public – that cell-based treatments are safe and predictable, he argues. Ye is also confident that the attraction of technologies that can cure ailments and not just treat them will prove irresistible. In marketing terms, that’s advanced biomanufacturing’s unique selling point – and it’s a strong one.